No doubt you’ll stumble onto this one if ever you Google “haunted houses in London.” That’s because, located in the posh West End, this home was once regarded as the MOST haunted house in London. If you stroll by 50 Berkeley Square, you’ll see one of London’s standard historical markers, a blue dot signifying that former Prime Minister George Canning used to reside there until his death. It is said he had experienced some supernatural stirrings during his life there, but the fright really hit the fan in Victorian times when a Mr. Myers resided there (Michael, by chance? Bwahahaa…). Jilted by his fiancé, he supposedly became a recluse, secluding himself in the attic room and going slowly mad. 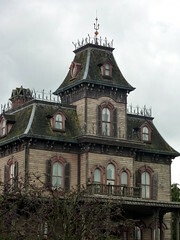 The house fell into disrepair during this time, giving it a rather ghoulish, decayed exterior. And you know how I just wrote the other day about students receiving exemptions on council tax? Well, Mr. Myers’s failure to pay his tax was apparently excused because the house was haunted. In the years to follow, the stories ran that a maid went mad with fright while preparing the attic room, dying in hospital the next day. Next, a gentleman took up the challenge to stay in there and was afterwards pronounced dead of fright. Among other witnesses to the terror was a young sailor who died while fleeing the property (he tripped), while his friend claimed they were attacked by Mr. Myers’s ghost. Different versions of the tales will also attribute the negative energy here to either a young woman who was raped and committed suicide by jumping out the window or a violent lunatic who’d been locked in the room and fed through a hole in the door. The house is currently occupied by antiquarian booksellers Magg Bros. Located on Ham Street between Richmond and Twickenham in the southwest, Ham House is one of a series of grand houses in London running along the River Thames. It had originally been constructed in the early 17th century for Sir Thomas Vavasour, the Knight Marshal to King James I. Later, during the reign of Charles II, the King’s minister lived there—the Duke of Lauderdale. On a lighter note, modern visitors of Ham House allegedly enjoy a dog-ghost (a King Charles spaniel, to be specific) that roams the grounds outside during the day. This northeast haunt was built in the 16th century by Sir Ralph Sadlier and is one of the oldest—if not the oldest—houses in London’s Hackney district. The restless spirit of at least one woman roams this red-brick Tudor home, and along with voices speaking within its unoccupied rooms, some witnesses to Sutton’s paranormal activity have heard yet another dog-ghost wailing from the afterlife. Now we get into haunted houses in London that private residents actually still live in (a head’s up if your London Relocation agent takes you there, ha!). A particular home on Beacontree Road is said to be haunted by an old woman. Specifically, she’s often seen in the dining room where she was locked up by her family. A male specter also appears at this residence, standing over the beds of females as they sleep at night. One London resident who lived on the property for 16 years moved out of it three years ago. He attests that the female spirit was very benign, sticking to the room where she’d been imprisoned, but that the male was aggressive and gave the resident’s girlfriends a hard time; allegedly, the man had lost a daughter so was perhaps looking for her. According to this resident, this house is now “clean,” psychic-style. Yes, the dead are alive and not always well in this city. If you’d like to get your freak-out on and discover more haunted houses, check out Avenue House (in Finchley, north London), The Shady Old Lady, and Haunted London (see also my previous posts on haunted pubs).